Submitted by Jason Horton on Friday, June 15, 2018. This was written by Jason Horton who is the Owner and Editor of this website, and if you're interested you can find out where he plays here. 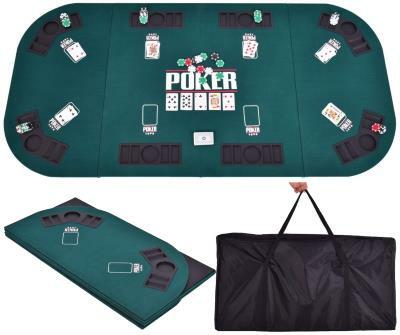 As I write this, WSOP 2018 is in full swing, so I thought this would be a good time to update my recommendations on folding poker table tops for home games. These new recommendations aren't based simply on my personal opinion, instead they're based on analysis of more than 1,300 opinions from people who have bought or used them - you can read more about that in the Methodology section at the end of this guide. As an experienced casino and live tournament player myself, I've also provided some advice for those of you who don't have much experience with poker tables. Having a proper felt table is much better than playing your home games on a regular kitchen table top. Not only do they add a touch of class to the game but cards also slide more predictably across the surface resulting in fewer misdeals. 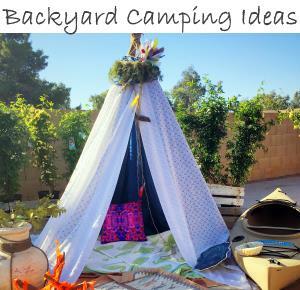 Size: For octagonal tops the main consideration is how much space it takes up when bagged and stored. 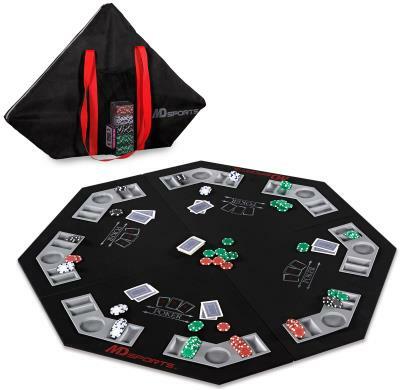 Many people use their poker tops on tables which are larger with many people using 48" tops on 60" (5 feet) round tables. They can also be used on square tables. I personally prefer a top that's slightly larger than the table it's sitting on, however you have to be careful not to knock the top and topple everyone's chips when sitting down. Octagonal tops are usually measured from point to point, not side to side. For oval tables the main consideration, other than folded size, is that length is similar to the table it's going on so people at the ends don't have to reach too far, but it doesn't have to be an exact fit. Playing Surface: All the tops recommended below have a felt playing surface, however some of them are decorated and some aren't. One issue that often arises with cheaper tops that are decorated is that the markings are printed on with inks or dyes that are sometimes sticky. This isn't always an issue for home players, but anyone experienced at dealing on a professional table will get frustrated with the way cards can stick to the paint when sliding across the surface. Portability: Although most folding tops come with carry bags, the quality of the bags tends to vary a lot. If you're planning on carrying the top around with you, pay special attention to the review analyses below. Folds: The more folds a top has, the smaller it generally is when stowed away, however the folds can crease over time leading to cards getting caught sometimes leading to misdeals. To minimize the risk of this happening, get one with the least number of folds for its type if folded size isn't a concern for you. Extras: Some tops come with extras such as cards and chips. Generally these tend to be lower quality cards than I prefer - see my card recommendation below for a better option. Also bundled chips tend to be lower quality plastic ones that are okay for some, but not for players used to the weight and feel of standard clay based chips, after all a good set of chips can cost more than many table tops. 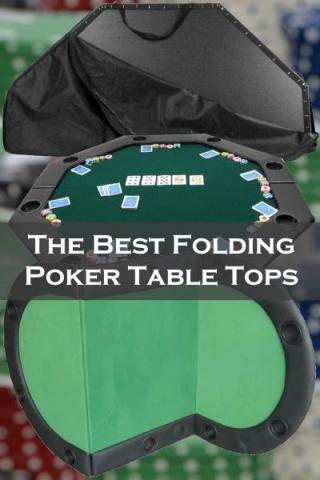 I've organized this table to show the highest rated small, medium, and large size poker table tops in each of the two categories - click on model names for detailed meta reviews further down the page. At only 46" across, this is one of the smallest options currently available. It folds 2 ways making it much smaller than most other options when folded. It comes with a carry bag and a basic deck of cards. It only includes a 100 piece chip set which is not really enough for 8 players, so if you don't have chips already you'll need to buy some more. It's made from particle board (MDF) with plastic cup and chip holders. There were approximately 3 times more positive reviews than negative ones. The most common themes were that people liked the carry bag, the table's portability, and its value for money. A few customers reported issues with the felt not being properly glued down - one cautioned that you should be careful when first taking it out and unfolding it. By having an additional fold, there is an extra crease across the table which means you have to be more careful when dealing to ensure cards don't get caught and flipped. It's worth noting that some of the people who complained about the bag gave the table top itself high marks. The HomCom B8-0001 has the highest ratings out of all the octagonal table tops on the market which seems to be due to its value for money in the 48" segment. 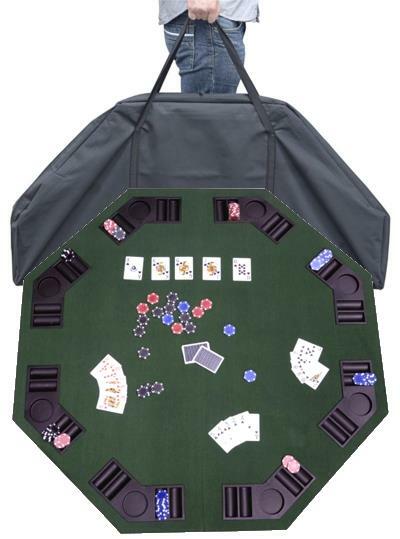 It has the most common size for an octagonal poker table top at 48" across. As you can see from the picture on the right, it uses a single fold - this does make it larger when folded than some options, but it also means there is one less join leading to fewer issues over time as it's packed away and taken out time and again for use. The manufacturer says it's made from solid wood, however 1 reviewer said it's more likely plywood. 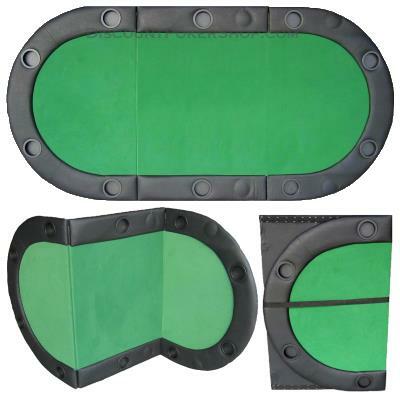 In addition to the green felt on top, the back is covered with black felt so there's no risk of it scratching your table. The removable chip/cup holders are molded plastic. The carry bag is made from nylon. The ratio of positive to negative reviews was 15 to 1. Many people said it looks good while others commended the construction quality of the table top (but not the carry bag - see below). Most agreed that it is pretty good quality for the price. There were many complaints about the quality of the nylon carry bag with several saying it got torn or was already ripped when it arrived, so be very careful taking it out or putting it back in the bag. A few people also reported that the plastic cup holders started to come out after a while. I mainly play on oval tables, however if I needed to get an octagonal table then after examining so many reviews, this is the one I would get. 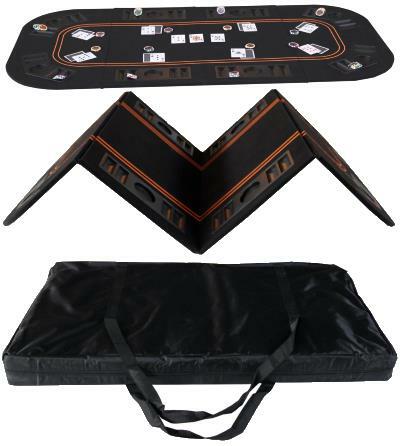 The raised padding around the edge means you don't have to worry about cards or chips falling off the edge when sliding across the table, and from personal experience they're much more comfortable when resting your arms on them. 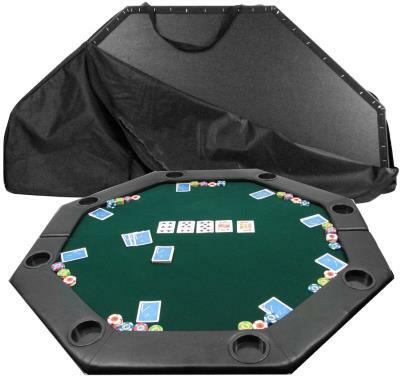 At the time of publication, I'm still waiting on Trademark Poker to confirm what type of wood it's made from, but I can tell you that the padded sides and the bottom surface are made from vinyl. The carry bag is made from nylon. Many people commended the build quality in their customer reviews. The padded sides also garnered many positive comments even from players with a lot of casino and live tournament playing experience. Several people said that the cards slide across the table nicely - it doesn't have the 'sticky paint' issue that some of the cheaper decorated tops have. Some people weren't happy that this table doesn't have chip holders, but I've never found this to be an issue as my friends and I prefer to organize our chips in 20 chip stacks on the table as we do at casinos. There were also some who were unhappy that the 51" measurement was from point to point rather than from side to side meaning that the top was smaller than they expected, but many of those still gave it the thumbs up overall. This top has good ratings but it's usually only bought by people with a small table to put it on - most people opt for one of the larger sizes below. The manufacture hasn't yet provided me with detailed specifications, but based on user reports it's made with solid feeling wood. It also comes with a carry bag as you see in the picture. The most common theme is customer reviews is that this top is solid and well made. There were no consistently reported negatives in customer reviews. Total Weight: 29 lb although some owners report that it's actually a few pounds heavier than that. This top is made from MDF wood with a felt top and PVC carry bag using its 4 segmented folding design. 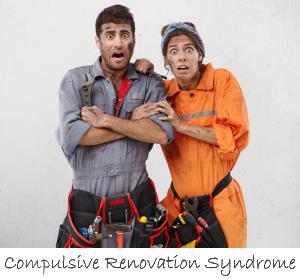 The positive reviews outnumber negative reviews by more than 15 to 1. Several people report that it's solidly built - some even found it to be heavier than they expected which is good because it tends to stay i place without moving around on your table. "Great value for the money" or words to that effect were present in many reviews - some even said it was better than they expected given the low price. The printed markings on the surface are a little sticky and sometimes catch cards as they're being dealt. Other than that the only other consistently reported negative was from a few people who said the felt creased or the joints came loose after repeated use. NB: This top does not come with a carry bag. Despite this top having lower ratings than the 2 smaller options above (possibly due to its higher price tag), this is the option I would choose for myself after having personally read all the reviews for all the options recommended in this guide. It's built from solid wood and is nice and heavy (51 lb) to ensure it sits firmly on your table. I personally prefer a more weighty table for this reason, after all you spend more time playing on it than you do carrying it around. It also has padded sides which is a big plus for me. Due to its 3-fold design, it takes up more space when folded than other options, however this also leads to a smoother playing surface with fewer creases. The build quality and the playing surface were praised by many. Positive reviews outnumbered negative ones by 8 to 1. With no printing on the surface it doesn't have problems with cards sticking as they slide across. 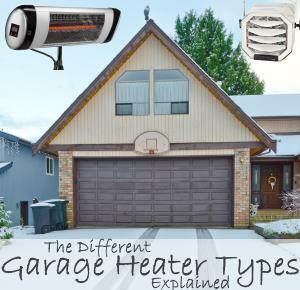 One reviewer said they had owned it for over 3 years without any issues arising. There were no consistently reported negatives other than a couple of people who said they received damaged or low quality ones, and a couple of people who lamented the lack of a carry bag - one owner suggested saving the box it comes in for storage. If you're still using basic playing cards then you should get a set of Copag cards. These are the only ones I ever recommend - in my opinion they are superior to all other sets of cards because they don't easily mark or get creased. Not only do they last for years, it's very difficult for a cheat to bend or crease the corners to mark them during play. The first set I bought lasted for over 10 years! *All of the products recommended above were selected based on their PolyRated scores out of 1000. These scores were calculated by analyzing reports and reviews by owners and users, assigning a score to each source and then processing those scores algorithmically to produce an overall score that reflects market sentiment about the product. The analysis included over 1,300 review sources of 18 models from 9 brands: Brybelly, Da Vinci, Giantex, GLD Products, HomCom, IDS Home, JP Commerce, MD Sports and Trademark Poker. The models with the highest rating in each category for each of the 3 sizes were then selected to be recommended above.